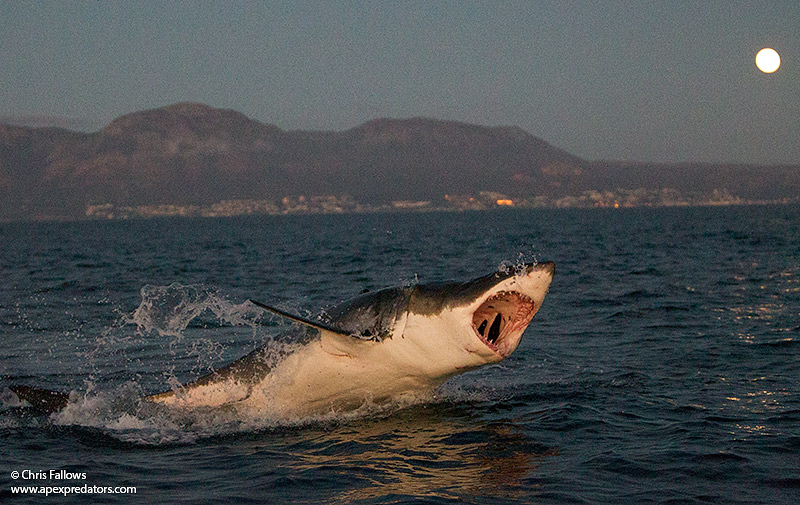 False Bay near Cape Town is one of the few places in the world where great white sharks can be seen breaching as part of their predatory behaviour. Breaching is a special adaptation learned by the great white sharks around Seal Island to help them surprise and capture their prey. This intense hunting behavior lasts the entire South African winter from June to October. 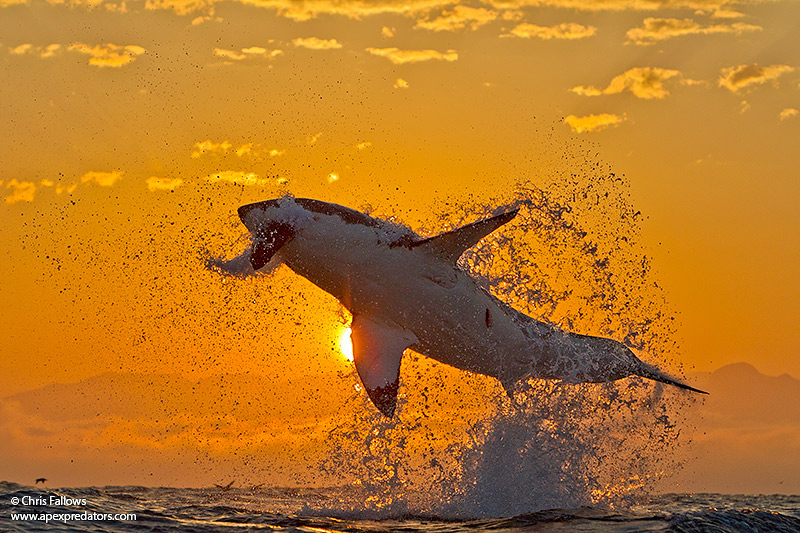 The great white sharks who fly out of the water in False Bay, seem reluctant to do so in other parts of the world. Great white sharks seemed to have learned that not only is breaching the most effective way to catch seals, but also the best way to beat other sharks to the punch. Seal Island may be the most dangerous place to live as a seal. The island is situated nearly 6km from the mainland and is home to around 64,000 Cape fur seals. The island is famous as the hunting ground for some of the largest great white sharks in the world. When seals cross deep water, making their way to or from their island sanctuary, the waiting sharks (swimming at depth) hurtle themselves skyward. 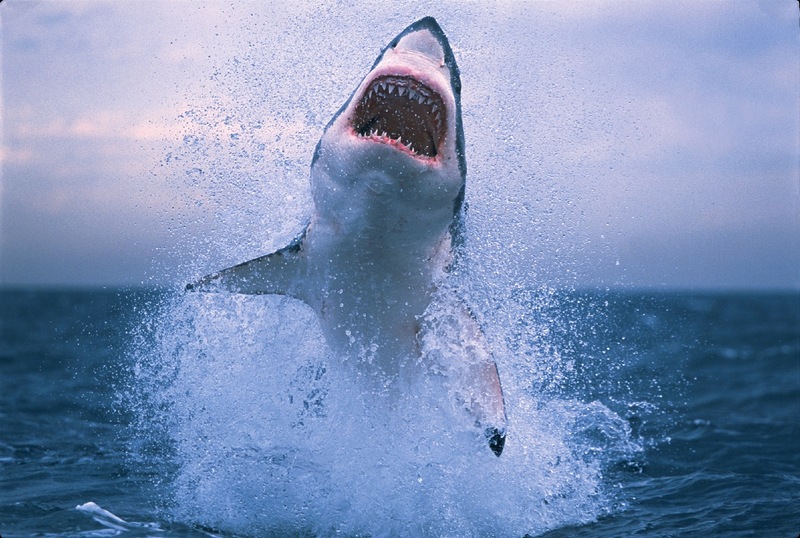 Great whites break the surface of the water at about 20mph / 32kmph – fast for a fish. The ferocity of the ascent often results in both predator and prey exploding like a cork from a champagne bottle. The most active time for sharks to hunt seals is right after sunrise, when the seal’s silhouette can be clearly seen but the water is still dark enough for the sharks to remain concealed. On a good morning, guests can witness up to 6 breaches, although as with any natural phenomenon, this is unpredictable. 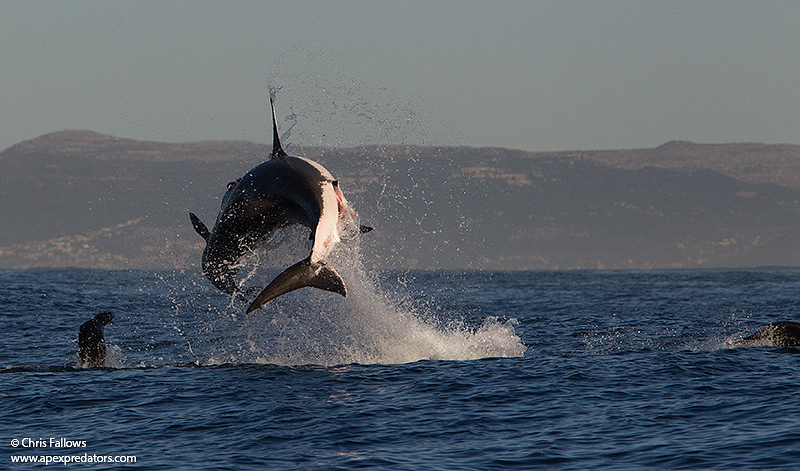 Book your morning or afternoon trip to see the ‘flying’ sharks of False Bay with Shark Zone tours today. You can check out the full list of trip details here and more exciting tour options here. Alternatively, get in touch at +27(82)894 4979 or info@sharkzone.co.za.